I would recommend this book to just about anyone; from a CEO to a business owner to a housewife. It looks at the whole picture of time management and not just small portions. With the use of real life examples, questionnaires, and simple to read principles, the authors help you start seeing the areas in your life where you may able to make changes that allow you to be more productive. 1. Manage your energy, not your time There is nothing we can do about how many hours there are in a day. We gather energy from four separate, but very much related, sources: Physical, Emotional, Mental and Spiritual We must try to nurture each energy source; this book does a good job at helping you see why each source is important, as well as helping you find the sources that will be meaningful to you. 2. You must take time to recharge Loehr noticed that top ranking tennis players would take the time between each set as they walked back to the service line to lower their heart rate. This brief moment allowed players to sustain a consistent playing level throughout their game. He suggests that you must schedule moments in your day to recharge your energy. This could be as simple as deep breathing, listening to music while eating your lunch, or going for a quick walk. 3. Train like an athlete Athletes push themselves a little bit further with every practice, yogis move deeper into poses with every breath. The end goal is to accomplish a little bit more with every workout. Why should life be any different? Stress should not be considered a bad thing, just a chance to strengthen a muscle. Make sure to push yourself, but allow yourself time to recover. 4. Routines will save you on energy and keep you focused A routine will allow you to move through specific times during your day without putting too much thought or energy into what you’re doing. The ritual aspect of it can also help you create your strength and define your values. Loehr explains that is also okay to change your routines to help keep you excited and energized. 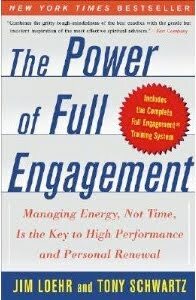 “The Power of Full Engagement” is broken up to two parts: Part One discusses the major premise and theories of the book in easy to read and understand sections. Part two is a guided process with questionnaires and worksheets you can start to find your own methods for your best performance. The book is written with great examples and real life stories. I found it very easy to follow along and got a lot a great ideas on how I can make changes in my own life. I love when I find a book that can make an impact in my day to day way of living. The goal now is to apply what you have read and to stick to it. I will definitely read this book again. I would love to hear your thoughts on this book, and if there are any other books you’d like to suggest for review, please let us know! Next Next post: What is Your Marketing Strategy?